Crepidotus applanatus is a tiny, kidney-shaped fungus that appears on dead wood of deciduous broadleaf trees. 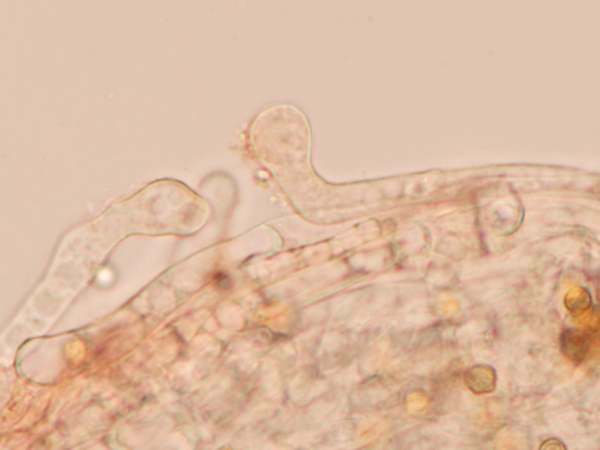 The attachment is sessile (having no stem). 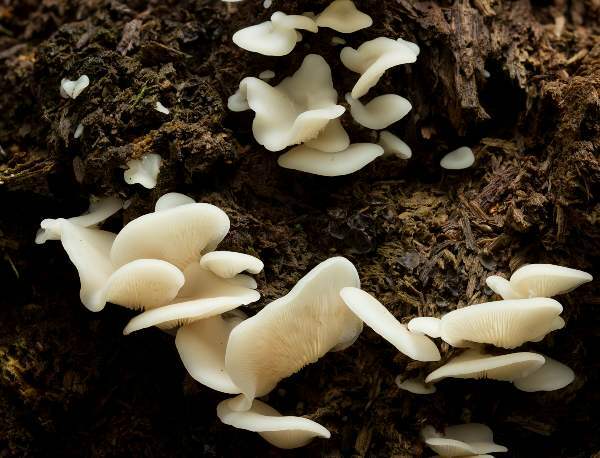 Uncommon but quite widely distributed in woodlands throughout Britain and Ireland, this mushroom occurs across mainland Europe and is also recorded in many other parts of the world including North America. The Flat Oysterling was described in 1796 by Christiaan Hendrik Persoon, who established its basionym when he gave it the binomial scientific name Agaricus applanatus. 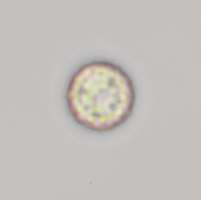 It was German mycologist Paul Kummer who, in 1871, transferred this species to the genus Crepidotus, whereupon it acquired its currently accepted scientific name Crepidotus applanatus. Synonyms of Crepidotus applanatus include Agaricus applanatus Pers., Agaricus putrigenus Berk. & M.A. Curtis, and Crepidopus putrigenus (Berk. & M.A. Curtis) Sacc. The generic name Crepidotus comes from crepid- meaning a base, such as a shoe or a slipper (although some sources state that it means 'cracked'), and otus, meaning an ear - hence it suggests a 'slipper-like ear'. In the past mushrooms in this genus were sometimes referred to as slipper mushrooms. The specific epithet applanatus means of a flattened (planar) shape. Petaloid, typically 1 to 4cm across, the smooth cap is initially white, turning creamy-ochre with age. The fruitbody is stemless and attached to its substrate via the upper (infertile\0 surface of the cap. When wet the cap margin is translucently striate. 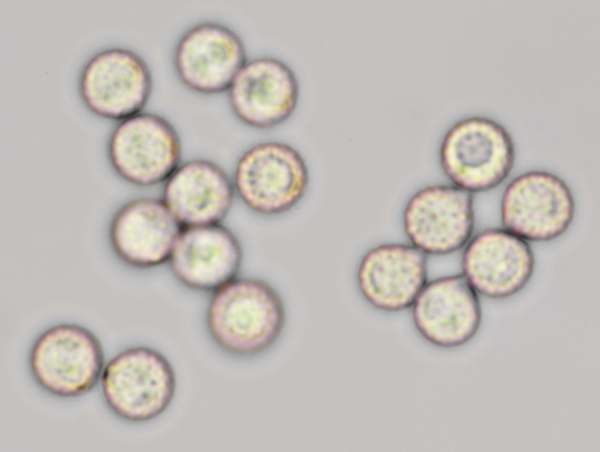 The pileipellis is a cutis with hyphae 3-9μm in diameter and with some erect terminal elements (left) with the rounded apex expanded to 11μm diameter. The gills, which radiate from the point of attachment, are crowded. Whitish at first, they gradually turn pale brown. This woodland mushroom has no stipe (stem) at all. Globose, 4.5-7 x 4.5-6.5μm, ornamented with minute spiny warts. July to October in Britain and Ireland. Crepidotus cesatti has a scalloped margin. Crepidotus mollis has a transparent cuticle layer that is evident when the cap is stretched. This summer and autumn species is considerd to be inedible. Many authorities give this genus family status as Crepidotaceae, while others include the genus Crepidotus within the family Inocybaceae; this should be a warning that these little fungi are not for eating, as some Inocybe species are deadly poisonous. 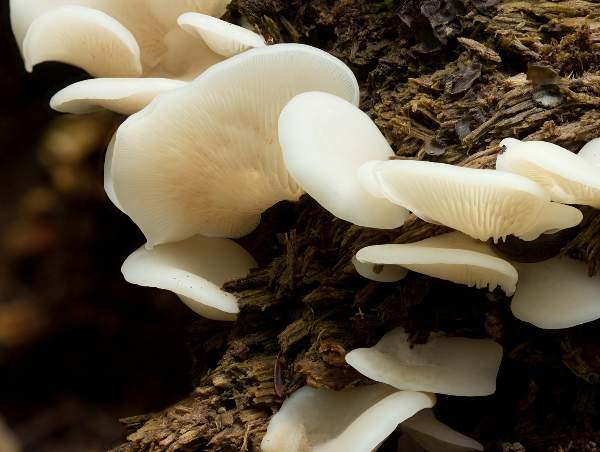 Care is needed, therefore, when collecting edible Oyster Mushrooms Pleurotus ostreatus, to avoid accidentally gathering Flat Oysterlings instead. Pat O'Reilly; Fascinated by Fungi, 2nd edition, 2016. British Mycological Society. English Names for Fungi.